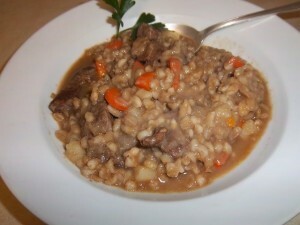 Beef barley soup. Cold comfort. Get it? Husband had a cold and I . . . Oh, never mind. Husband came down with a fluish cold this week. He must have been Portuguese in another life, because he’ll eat soup any day for any meal, in sickness and in health. But he especially craves it when he’s sick. So I reached back into the comforting past, to Grandma’s kitchen and an ingredient I haven’t used or eaten in quite some time: pearl barley. Except for the occasional cup of smoky barley tea in a Korean restaurant, I haven’t made barley anything of late. It’s a healthy grain sadly underutilized in the U.S., though valued in Asia (even if there it’s considered everyday or even poor person’s food). I love pearl barley’s creamy but still substantial texture and mellow flavor and the way its starch thickens soups. We always called it “pearl” barley, but properly, it’s “pearled,” meaning hulled. Pearled (or “pearl”) barley is to barley grains as white rice is to brown; it’s been hulled and finely polished. It’s the most common form of barley found in grocery stores. Barley for flour is generally malted — allowed to sprout, then dried and ground. Japanese lightly toast barley, grind it and package it in tea bags for mugicha, a plain tea almost universally served cold. Koreans make tea bags, too, but are more likely to thriftily purchase whole, toasted barley, boil it briefly or steep it in hot water, strain it and serve it either hot or cold, depending on the weather. This is called boricha; some local Korean restaurants serve complimentary cups of cold boricha as a digestive. As barley is naturally a bit sweet in a vegetal sort of way, these teas need no sweetener. They contain no caffeine and are considered health aids. Tibetans, too, drink barley tea too, called tsampa. They use their cold-chapped fingers to stir toasted barley flour into their famed yak butter tea for a bracing, nutrition-packed pick-me-up. Hulled or pearled barley can be treated like rice: boiled or steamed in water or broth; Koreans sometimes steam rice, corn kernels and barley together as a starch side dish. It can also be breakfast food, like oatmeal: boiled with honey and spices, with butter stirred in at the end. But back to more familiar territory: soup and bread. I went through a Celtic cooking phase during which Scotch broth — a lamb-barley soup or stew — figured large in my life. You have to like the assertive flavor of lamb, blood and bone, to appreciate this soup. Based on my summertime travels there, I think one winter in Scotland would probably convert you; their kind of cold calls for hot, substantial, power-packed foods. I’ve made barley bread, a baked or griddled flatbread (barley doesn’t contain gluten, so bread made from barley flour doesn’t rise). This bread is so hardy and rustic you feel as though you should be wearing a homemade dress of scratchy linen that you wove yourself and dipping the bread in milk from your own cow. Barley flour can be purchased online or at some health food stores and may be eaten by people who are gluten-intolerant. My beef barley soup is based on my grandmother’s. Because she filled her freezer with Chinese takeout cartons full of “solid pack” (rough-chopped, lightly cooked whole tomatoes, skin, seeds and all) from her garden, pretty much all of her soups and stews were tomato-based. But I love capital B beef gravy, so I skip the tomato and use beef broth instead. If I have frozen homemade stock, I use that, boiling it down a little to concentrate the flavors further. If not, I use canned broth. Alter the recipe to your taste: Add a can of tomatoes, vegetables that are in season, dried herb mixtures that please you. In a soup pot, bring the beef broth to a boil; stir in barley, lower heat to medium and boil until barley is tender, about 20-30 minutes. Meanwhile, peel and chop the vegetables and place them in water to cover so they don’t dry out or turn brown. Also meanwhile, heat 1/8 inch of vegetable oil in a frying pan and brown dredged and seasoned beef. Drain off fat and place beef in with cooked barley. Add vegetables, water and all. Cook until flavors meld, stirring occasionally and adding more water if it begins to stick or thicken too much. Serve hot with good, buttered bread. I’m not sure it’s right that barley is OK for the gluten intolerant. There’s a lot on conflicting information about that on the web. Personally, I like barley a lot. Barley combined with wild rice and mushrooms makes a hearty side dish for beef dishes like pot roast. I also make a barley dish with saffron and lemon juice that’s great with roast chicken. Hmmm. You may be right. I’m not sure I meant to bless barley for gluten-intolerant people by mentioning it lacked the gluten to make bread rise. It might be low-gluten. I’m not sure. I didn’t research that aspect. Good point.